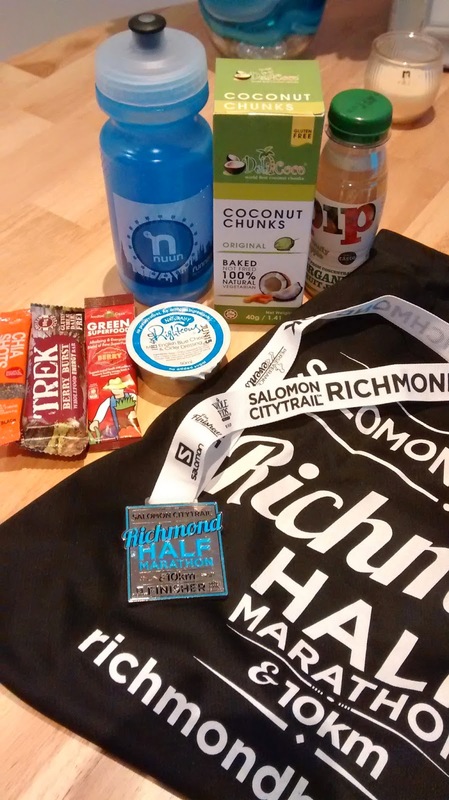 I hoped that having the Salomon CityTrail Richmond 10k in my diary would keep me running after Brighton Half! However I hadn’t counted on the allure of ClassPass and wanting to try all the new-to-me studios, so I think I’d actually run a grand total of twice by the time the day rolled round. I really wasn’t in an appropriate mindset to race either- the location of the race, combined with Sunday transport and engineering works meant I had to roll out of bed at 6am and catch a tram, train and a bus to the start line, when I would have much preferred a lie-in! If I’m honest I think this affected my running- never underestimate the power of negative thoughts! I arrived in Richmond at Old Deer Park, approximately 5-10minutes walk from Richmond Station (had there been trains running) and quickly headed to the portaloos. There were plenty and no queue which was great, as I had about 10minutes before the start of the 10k at 8:30am. I joined the crowd of runners heading towards the start line, and before I’d really had time to register what was going on, we were over the line and off across the grass. There was a quick loop of the park before we were on pavement, right beside the busy roads- not a particularly inspiring start. The lovely Cat caught up with me, and after a quick hello we ran together for a while which kept me going. Fortunately after about 5k we turned onto the Thames Path and joined the river, a much more scenic and familiar to me route. I distracted myself with sights along the river- rowers out for a Sunday outing, the big house at Kew, and heading back towards Richmond, the lock and Richmond Bridge. There weren’t any mile markers along the Thames Path section, only on the roads which did make it hard to know how far was left to go, unless you were checking your watch all the time. There was also very little support along the route, apart from nearer the start and finish, but those who were out were friendly and cheery, and the marshalls did a great job too. They had a particularly interesting challenge at the end of the race, as the finish line involved running through a car park (!) where lots of runners who had finished were trying to leave- not very safe, and had I had any energy left, meant you couldn’t really sprint to the end as you were concentrating on not getting driven into. 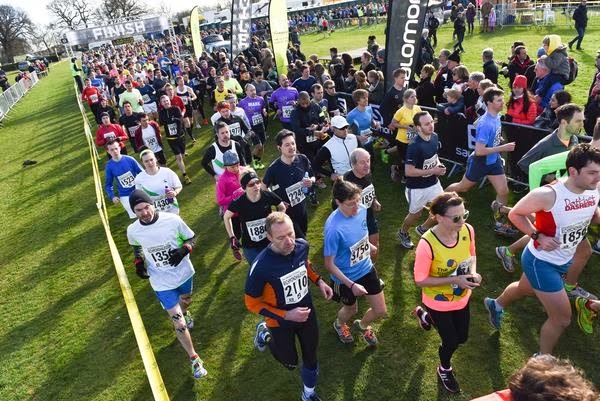 The final hundred metres was back into Old Deer Park across the grass, and after crossing the line I was given my medal – the same for 10k and Half Marathon finishers, apart from the ribbon around your neck. Then we were funnelled through a very well organised finishing area separated into men and women. Timing chips were removed from shoes, we were handed juice, Vita Coco, water, a Bounce ball, a goody bag from Whole Foods, and a technical t-shirt! For a 10k this was a great haul, and really put the terrible finish area at Brighton to shame! 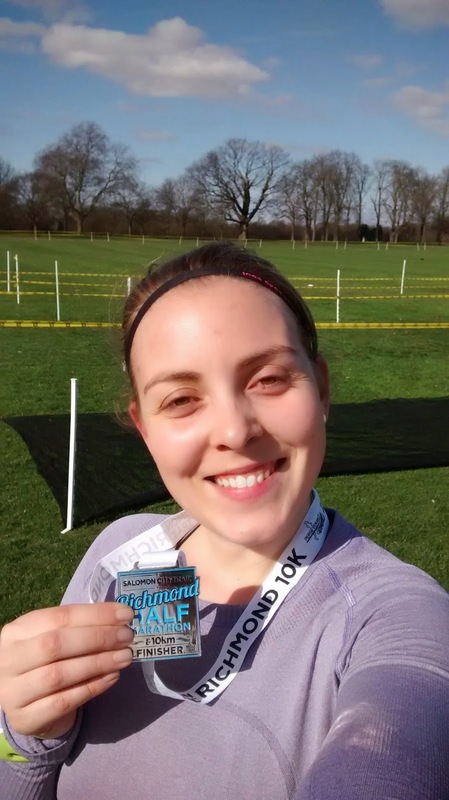 “I had entered the Richmond Half a few months ago hoping it would help keep me motivated after the Brighton Half (which completely failed and I did minimal running between the two – error!). 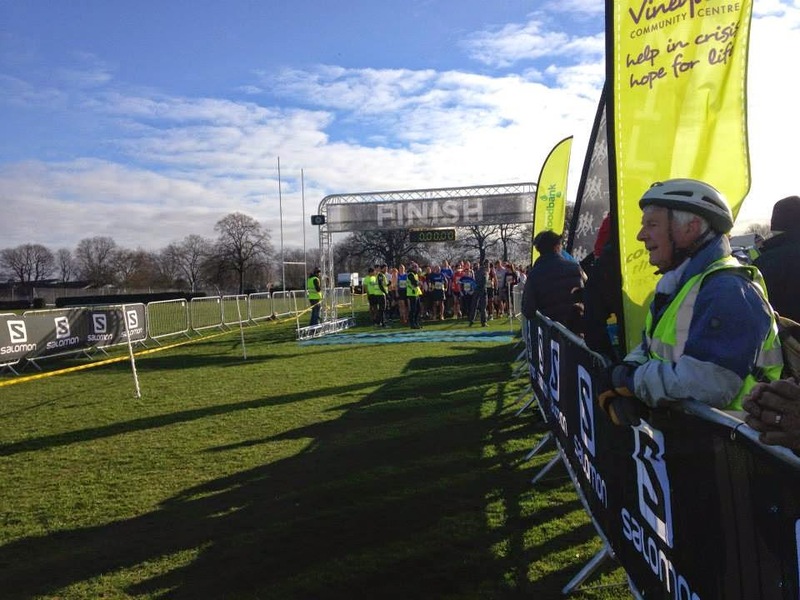 The race start in Old Deer Park was a walk away from my flat and I arrived at 8.50am to a pretty buzzing atmosphere! The race started on time and we were set off in waves with a few minutes wait between each. For the first 5k we followed the same path the 10k participants had ran earlier in the morning which Beki has already described. 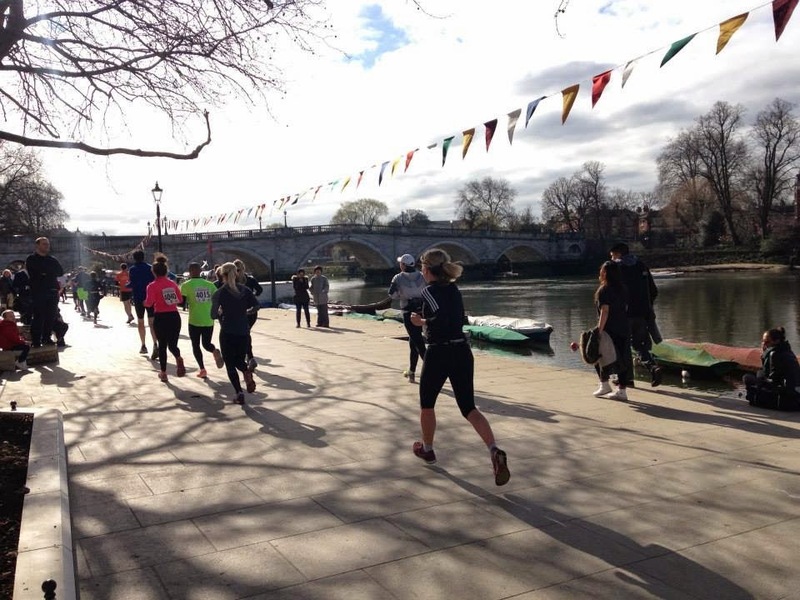 We then followed the Thames Path through Richmond towards Ham. At around mile 7, we turned off the Thames Path for a loop round the streets and woodland of Ham. Some of this stretch was single file through narrow paths, with little room to overtake. This suited me fine, but if you were going for a PB, it could potentially be a problem. At mile 9, we rejoined the Thames Path at Teddington and headed back towards Richmond for the finish, dodging cyclists/walkers/dogs along the way! Just before heading back into Old Deer Park, we had to cross a car park full of exiting cars which was less than ideal when you want to be getting to the end as fast as possible. After crossing the finishing line, I was handed a medal, goody bag and a t shirt (ladies fit woo!). I headed home pretty quickly but it seemed like there was quite a lot going on in the race village, including sports massages, hot food and retail stands. Some photos courtesy of the race event Facebook page. Great job! Although I must admit I'm very jealous of the green grass and budding trees – we still have snow on the ground!! It doesn't look super trail like :-S? Still, great job and cool goodybag! 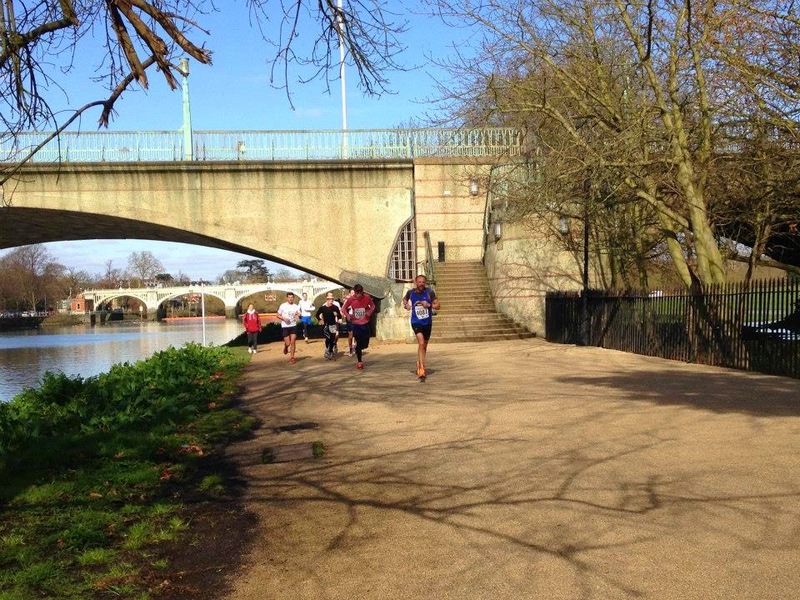 Sections of the Thames Path are more muddy and gravelly – I don't know if you've run around that area? But the photos do show the part near Richmond which was mostly pavement. 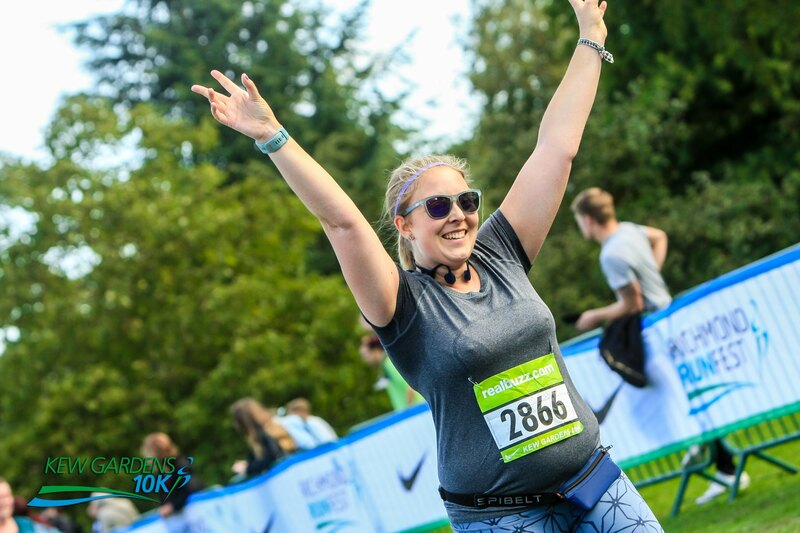 I think the Half Marathon got to enjoy more of the trail section than the 10k unfortunately! Great job! I love using races to motivate me! Well done! That's a great race haul too! 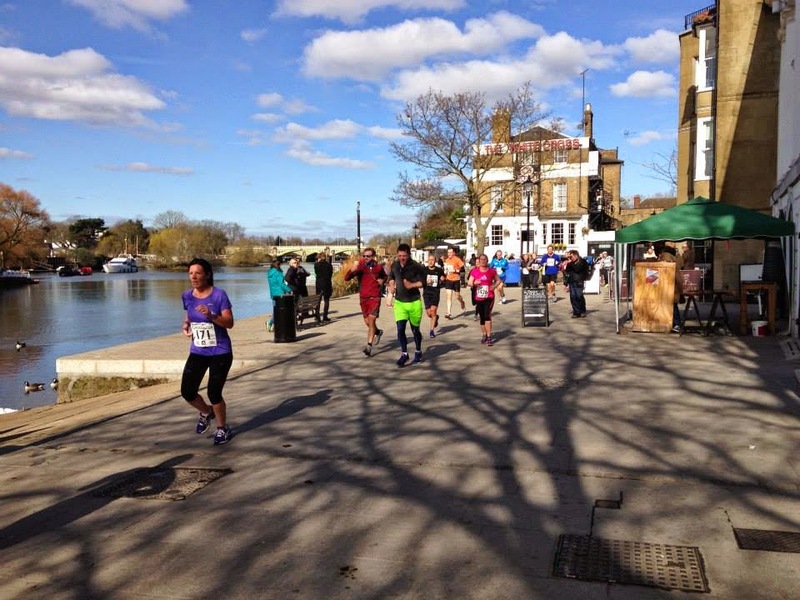 I did a marathon 2 weeks ago on that section of the Thames Path, it's such a great place to run. Great job, and a great goody bag too. 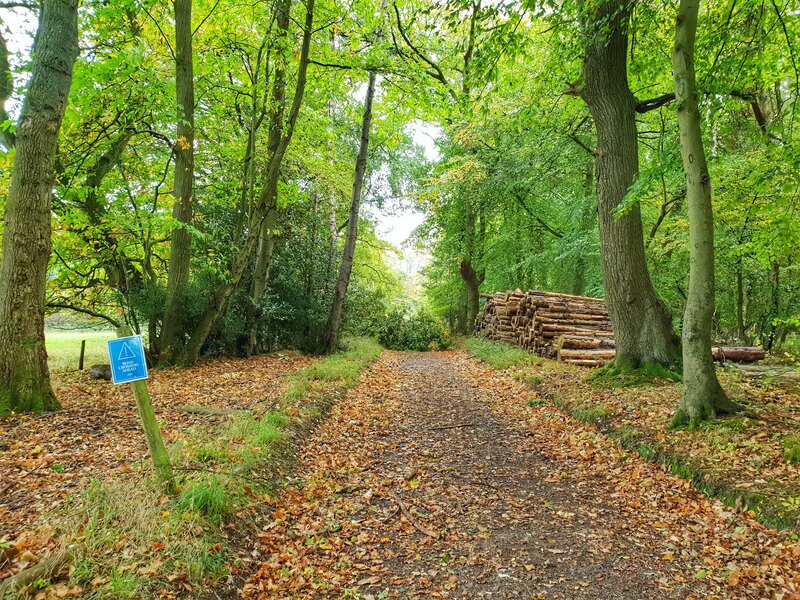 I signed up for a 15K last autumn that I thought was along the path, but ended up being around Richmond park. It was so pretty there, and I saw loads of deer and parrots (and no car park by the finish either- that sounds very dangerous), but the train stations nearby were closed and I don't know London that well, so after being dropped off and walking through the park I arrived 5 mins before the start, and then at the end had to just wander, and eventually found a road and called a tax, which cost £20 to get me to Wimbledon, then those trains were delayed- I think I finally got home at about 3 in the afternoon, very tired and hungry! Sort of put me off London runs!